Observation - Moth Pupa? - UK and Ireland. Description: Found on the shed floor whilst spring cleaning. Could you please identify the species and the stage of metamorphosis. The pupa is about 10mm lengthways and 2mm wide. Found on the shed floor whilst spring cleaning. Could you please identify the species and the stage of metamorphosis. 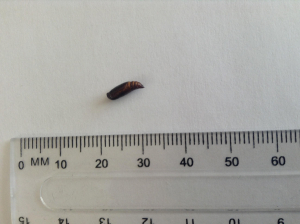 The pupa is about 10mm lengthways and 2mm wide.